In honor of National Poetry Month I am going to post one of my poems each day of April. 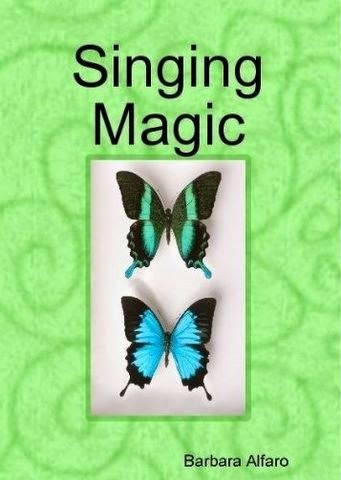 All the poems will be excerpts from the paperback edition of my poetry called Singing Magic. The poems will appear in almost the same order as they do in the book. Today's poem is a a free verse poem about one afternoon in New York's Central Park. Why not take a poetry break with your morning coffee and visit my blog often this month. What’s your dog’s name asked a boy of a woman and not waiting her reply continued My dog’s name is Riley My dog’s name is Lulu said the woman just then Riley a red dog reminiscent of Irish setters and German shepherds and other miscellaneous breeds and Lulu a beige dog of even more dubious lineage than Riley interrupted their afternoon swim in the model boat pond to shakesplash their owners a portable radio a pair of shoes and me They swam again then galloped and chased on the wet concrete Lulu doing most of the chasing with the grassy abandon city dogs on park days know making strangers laugh out loud and now intimidated by the sailors who were not laughing these handmade or purchased boats cost four hundred dollars baby and the pond is after all for them not Riley and Lulu the older brother of the boy attaches a leash to Riley’s collar and the woman bribes Lulu into a semblance of quietude with pets and scratches but mind you Lulu and Riley are eyeing each other all this time they’re approximately five feet away from one another and What’s this Oh no a beagle well a partial beagle bouncing into the pond a stick between his teeth guarded as though it were the golden fleece and Lulu that hussy swimming after his neat patched little body as though absolutely nothing has happened between Riley and her for God’s sake chained and barking in pain while a bumble bee is bugging pun intended me and a little girl lopes by announcing Now my other front tooth is crooked!